The murder of a well-loved San Francisco priest shocks the city. One young man, a traffic policeman (Tony Curtis), an orphan who idolised the clergyman, wants in on the hunt for his killer. He thinks he has a lead after he sees a distraught mourner (Gilbert Roland) at the funeral. When his superiors dismiss his admittedly tenuous suspicions, Curtis goes undercover to meet Roland. 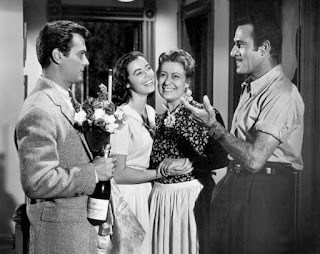 His swift inclusion in the man’s close and warm-hearted family creates a conflict in the young cop which may endanger more than just his investigation. 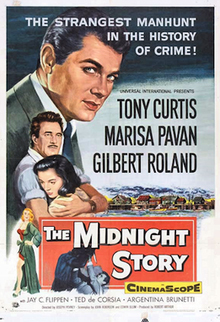 Though ostensibly a mystery, The Midnight Story is more a character study, a drama revolving around several people. With this aspect, the mystery actually takes second place, providing a reason for the story, rather than the story itself. In fact, it is the crime, with its revelation of a weak motive in the finale, which drags the movie down. The acting and the writing are good. Curtis quickly grows to care for the family into which he has been welcomed. He seems to alternate between suspecting Roland and defending him and, while this might be seen as a fault of the script, it actually reflects the callowness of the young policeman, and his earnest but inexperienced desire for justice. His romance with Roland’s strong-willed but susceptible cousin (Marisa Pavan) is believable, though Pavan herself doesn’t really suit the role of a girl much sought after by the neighbourhood Lotharios. For that matter, the casting of Roland is a bit strange. He is too old for the role. He was in his fifties when the film was made, and I thought initially that his charcater’s mother (Argentina Brunetti) was his wife - calling her “Mama” is not out of keeping with what some long-married couples call each other. Brunetti herself was junior to Roland, and certainly didn’t look older. The mother’s younger son (Richard Monda) was played by a teenager, which accentuated the oddity of Roland’s casting. It changes the relationship of Curtis and Roland from friend/brother to mentor/father. All of this is incidental, however. Roland is easily capable enough to make his performance credible. While the family drama portion of The Midnight Story is carried well, the mystery half is badly supported, so a whole-hearted endorsement cannot be given. The film works, but only modestly, a small movie that uses a crime to illustrate a domestic drama; certainly not a bad device, but not entirely successful. And the title has nothing to do with the tale - nothing occurs at midnight, not even the murder. I looked this movie up on IMDB, where they state it was shown on a double bill with "Tammy and the Bachelor." Criminy, that's quite a pairing. That's bizarre. I wonder who cinema-owners thought that pairing would satisfy. Maybe the die-hard Gilbert Roland / Leslie Nielsen fans.